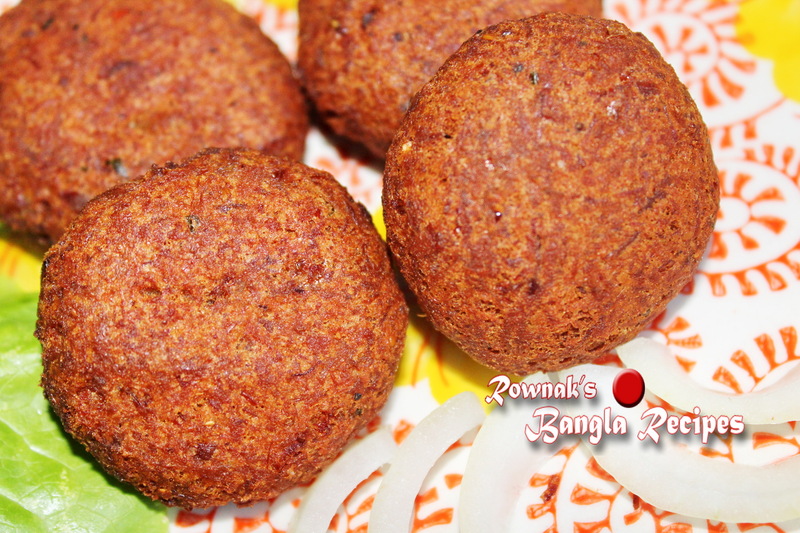 Shami kabab is The most popular kabab in Bangladesh. It is made with a small patty of minced or ground meat, (usually beef but occasionally lamb or mutton), ground chickpeas, spices and egg to hold it together. I tried to make the as easy possible and please check tips part if you are making first time. Best part of this kabab is its freezable, you can make this kabab, freeze it and fry it whenever you like. Enjoy. 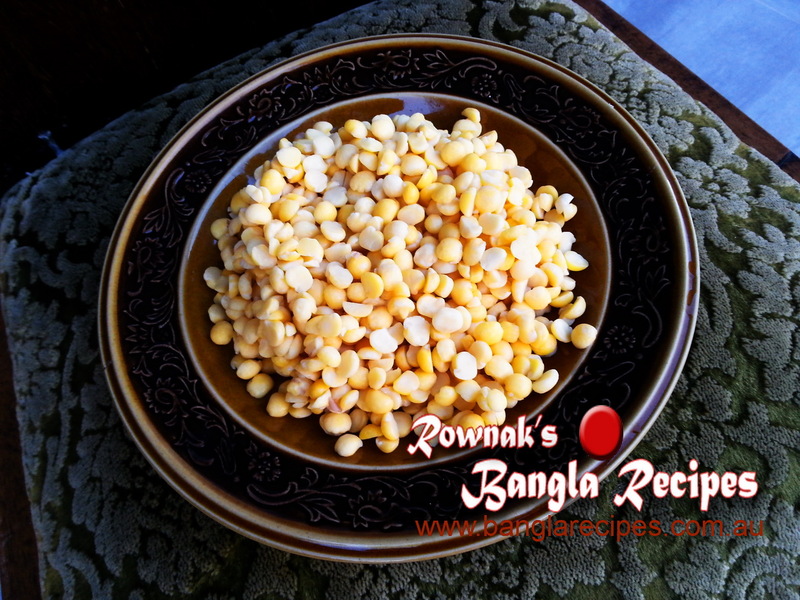 Soak yellow split pea (chana /boter dal) in water for 4-5 hours or overnight. Cut into small pieces, clean and wash beef and chana dal. In a heavy bottom pan put beef, chana dal, ginger, garlic, bay leaf, cinnamon, pepper corn, clove, cardamom, salt and water. Cook until the chana dal and meat become well cooked and the water is completely dried up. You can use pressure cooker too for this. Fry onion in oil till it becomes light golden brown. Remove fried onion from oil. 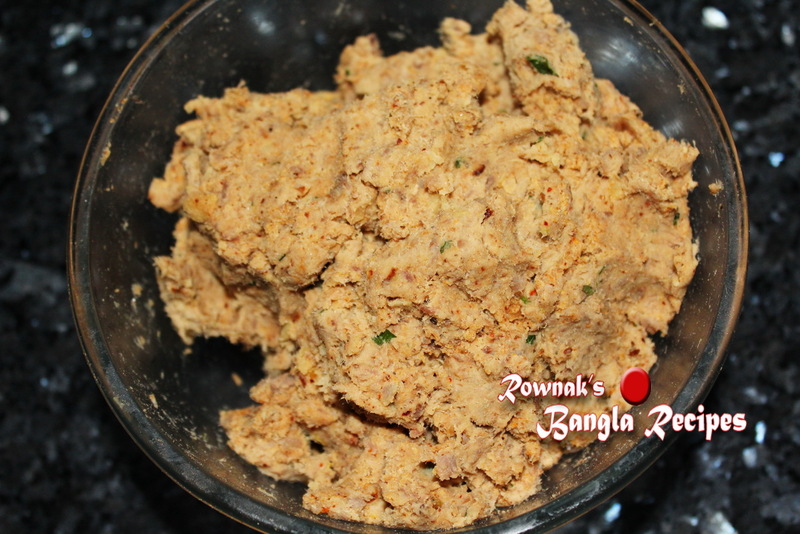 Grind all ingredients together except breadcrumbs and eggs to make smoothe paste. Put the paste in a mixing bowl. Add eggs and bread crumbs (for egg add little at a time, because we don’t want too soft dough which will hard to shape) and mix well. Make small round flattened balls from the mixture. You can even freeze kababs after giving the shape. Heat oil in a pan in medium heat and when oil is ready, put kabab in oil. Put 4-5 kababs in the same way (depend on your pan size and don’t overcrowd the pan) and fry them till golden brown colour come out in both side. 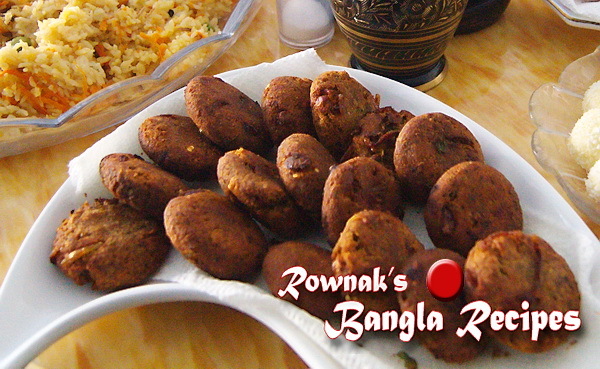 Serve Shami kabab as a snack or with Pulao, biriyani, khichuri, rice, Naan or paratha. If you are using mutton or lamb, add lemon zest in it to remove the smell. Make sure don’t have excess water in cooked lentil and meat mixture. Excess water will break kabab when you are frying it. Use enough egg which will hold the kabab. You can even freeze kababs after giving the shape. If your kabab breaks a part while you are frying, add more egg or dip in egg before frying. I made it yesterday.It was really really delicious. Thanks for your recipe. Rownak apu, tumi ki jano je tumi koto oshadharon…tomar reciper jonno na shobar jonno tomar effort ta shotti onnorokom….may Allah swt bless u and ur family..i am currently in malaysia and hv 2 boys..miss my country(like u 🙂 ) u remind me of my mum’s cooking.. Wow!!! your mum’s cooking!! I dont know you or your mum but I know the value of this word 🙂 . Thanks a lot dear.